Right, you can put that Donny Osmond song out of your head right now! This is the slots title, not the annoying cheesy pop song made famous by the pearly white teethed golden boy that ruined the lives of so many men during the 1970s. 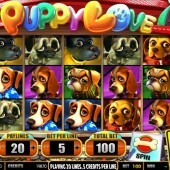 Puppy Love is in fact a 5 reel, 20 pay-line slot from 3D slot developer Betsoft Gaming that plays on that moment we have all experienced in life where we enter a pet shop and see the black doe eyes of a little puppy igniting that uncontrollable feeling of love inside… unless you’re not human or have a heart of stone! Ok, maybe that's being a bit judgmental but you get the idea. These little guys will melt your heart when you see them on the reels. This slot has reels that are full of the cute little guys who are all giving you the “take me home with you” look. In fact, so cute are the little creatures that there’s a chance you might punch through your computer screen to try and cuddle one of them. The Wild symbol is represented by the dog leash and it is the key symbol to substituting for any other symbol, except for the Scatters to complete winning combinations. The dog bowl symbol acts as the Scatter and if you hit three or more of these symbols across the reels then you will trigger the free spins bonus round earning you 15 free spins immediately. These free spins can also be re-triggered if you hit three or more of the Scatters across the reels during the free spins. All wins achieved during the free spins also have a multiplier value of 2x. This slot also comes with a Puppy Store Bonus that is triggered if you hit two or more of the Puppies for Sale symbols on any active pay-line. Once triggered, you are taken to a pet store where a number of puppies are on display in front of you. You must then choose your favourite puppy to reveal a prize in a Pick ’em Bonus style feature. 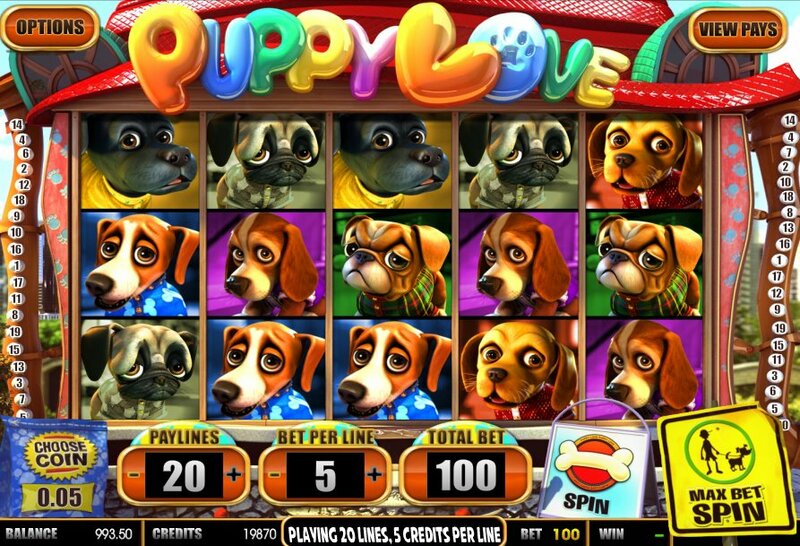 Puppy Love is one of the more creative slots to be released over recent months. It might be a slot that appeals to female players more than male players and kind of feels like a more comical and dog version of IGT’s Kitty Glitter slot. Sheriff Gaming’s 3D slot Dog Ca$her will also feel like a similar slot to play. The bottom line is that Puppy Love has free spins, Wilds, Scatters, multipliers and a Pick’em Bonus with some slick graphics and quality game play. It’s a cracking release from Betsoft Gaming and one that will have you playing time and time again for quite a while.